The Battle of Hennersdorf was a fictional encounter fought in the region east of Dresden. The game was fought over a single day and involved six players. Three players commanded the French where Napoleon had organised his army into three columns. The three allied players each commanded each of the three allied armies, being Prussian, Russian and Austrian. The allies marched in three columns. To the south-east, and forming the Allied left wing, having crossed the Austrian border, are elements of the Austrian army under command of Prinz Schwarzenberg. The Austrian army comprises some 51,500 infantry, 4000 cavalry and 120 cannon. From the east, and forming the Allied centre, march the Russians under Barclay de Tolly. Russians contribute far fewer infantry though these are well supplied with artillery. Indeed, the Russian three Corps field only some 24,000 infantry but are supported by 4000 cavalry, 2000 Cossacks and 156 cannon. Finally from the north-east, and the Allied right wing comes Blucher and his Prussians. Blucher has under his direct command a Prussian army of 36,000 infantry, 6000 cavalry and 114 cannon. Combined the allies fielded 111,500 infantry, 16,000 cavalry and 390 cannon. The three French columns were as follows. Murat marched from the north-west while from the south-west Ney pressed forward with speed. Coordinating the two columns was Napoleon, who also watched over the centre, and marched directly from the west. When combined on the battlefield Napoleon would command 110,000 infantry, 17,500 cavalry and 252 cannon. The figures are mostly from the excellent Heroics & Ros range, with the exception of the Austrians which are Irregular Miniatures. 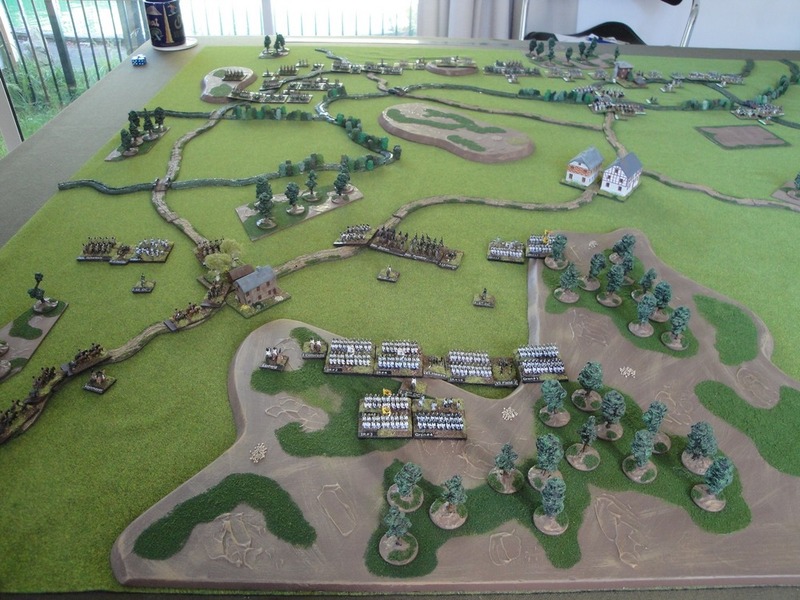 The figures are all based on Volley & Bayonet half scale bases which means massed infantry bases are 1.5″ square. At this ground scale 1″ equates to 200 yards. The gaming area measured 1.8m x 1.2m and therefore represents an area some 8 miles in length and 5.5 miles in depth. The Advance Guards of Napoleon’s and Ney’s columns, as well as those of the Austrians were first on the field. 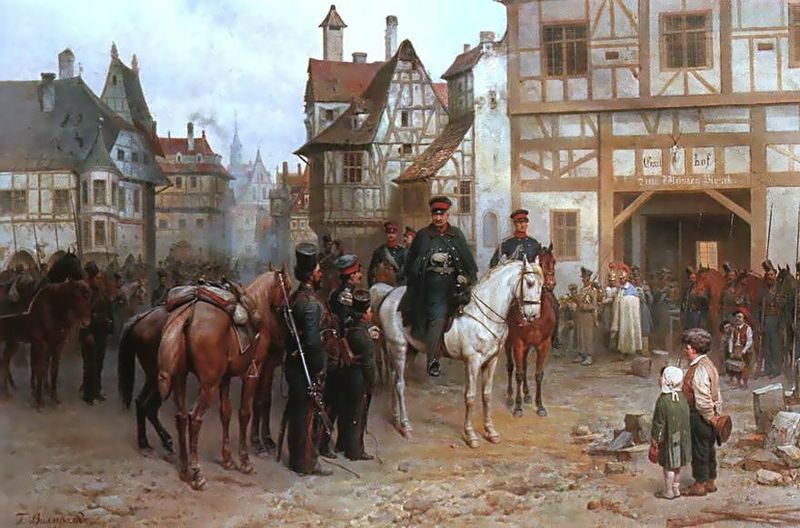 An hour later the Prussian Advanced Guard entered the area north east of Hennersdorf. At the same time more French troops reinforced Ney and Napoleon, while the Austrian main body reinforced Schwarzenberg. However Murat, advancing from the north-east, and Barclay de Tolly advancing from the east with his Russians, were still an hour from the battlefield and strung out in march column. Above, the general situation with the French on the left and Allies on the right. The Austrians are visible on the left foreground. 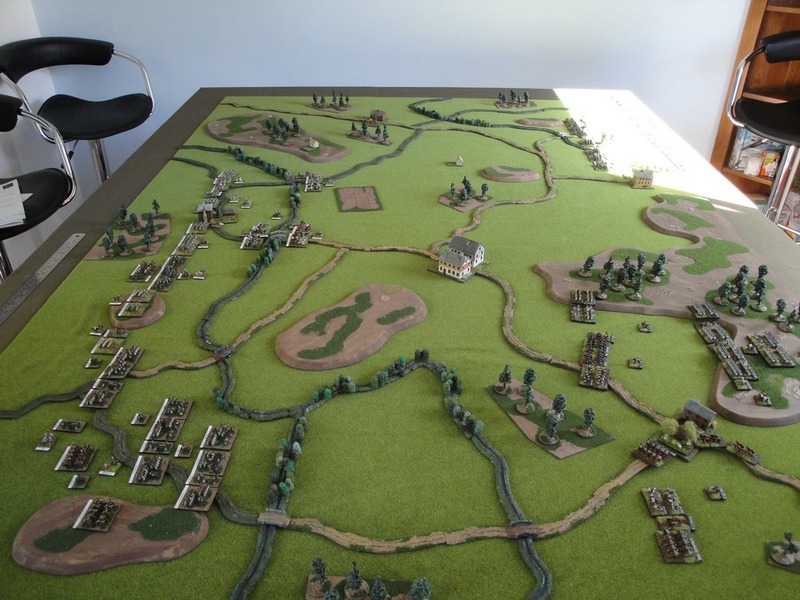 Hennersdorf is visible in the centre of the table and the Prussians are obscured by the sunlight in the top right. The Russians, should they arrive will between the two. On the left of the picture are the French. Ney’s forces are visible in the left foreground while the French centre, under direct command of Napoleon, extends north. Murat will eventually arrive in the far north-west and form the French left. The streams have mostly formed banks and the woods are classed as forests. Below, another view of the battlefield this time viewed from the Austrian lines with Ney’s forces in the distance. Ney, acting as wing commander, commanded Marmont’s VI Corps and Souham’s III Corps though a portion of III Corps is still to arrive. Schwarzenberg’s Austrians comprised Colloredo’s I Armeekorps and Keinmayer’s III Armeekorps. At this point not all elements of the III Armeekorps are deployed nor is the Austrian Cavalry Reserve. Below can be seen the general area where the Russians will eventually deploy. Barclay de Tolly commanded Gorchakov’s I Corps, Wurttemburg’s II Corps and Sacken’s XI Corps. These were supported by a Converged Cavalry Corps under Vassil’shikov comprising three divisions, including a Cossack division. 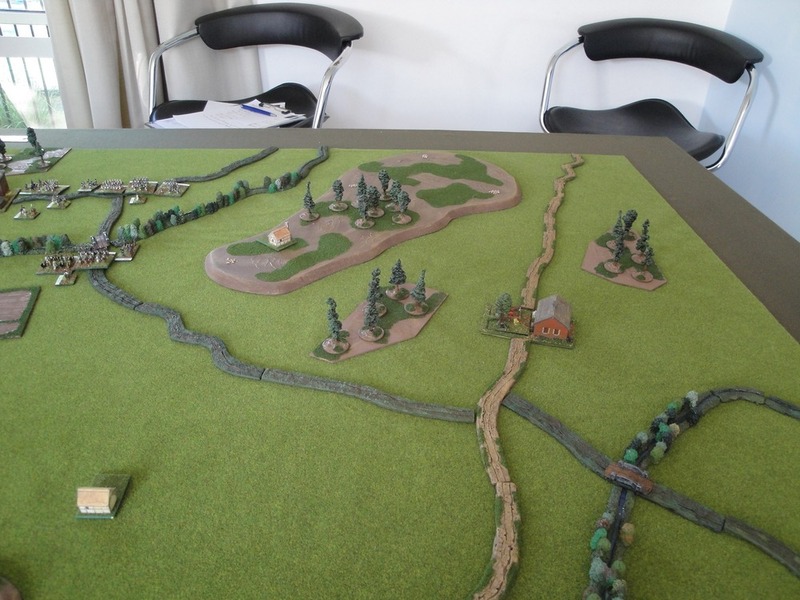 In the distance Napoleon’s advanced cavalry advance across a stream to threaten the Allied centre. Napoleon’s column comprised Oudinot’s XII Corps, Victor’s II Corps as well as Latour-Mubourg’s I Cavalry Corps. In reserve is a Converged Guard Corps under Mortier of two divisions, whih is still to arrive in two hours time. 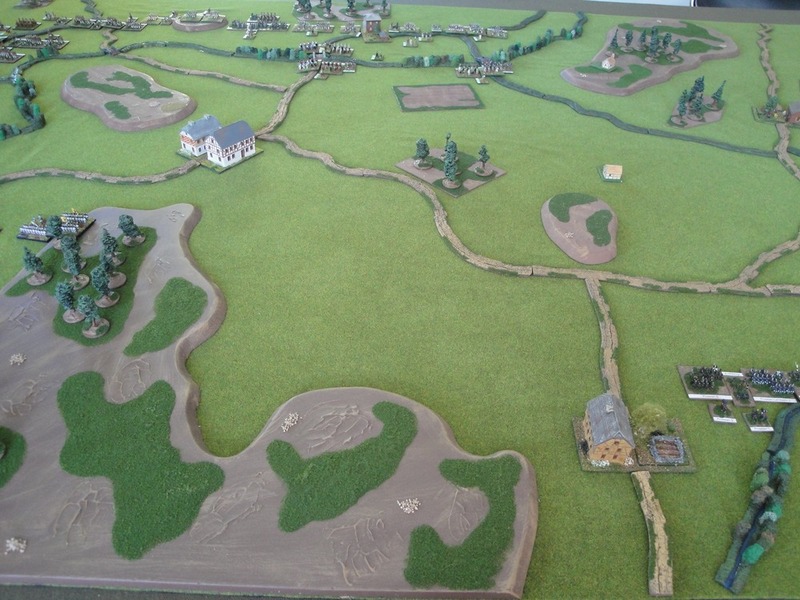 Heenesdorf can be seen in the centre left and formed the left flank of the Russian sector. Finally in the north Blucher’s Prussians comprised von Kleist’s II Corps and elements of Bulow’s III Corps. Opposite them would be Murat’s wing which comprised Sebastiani II Cavalry Corps, Rapp’s X Corps and Bertrand’s IV Corps. Part II of the article describing the Battle of Hennersdorf can be found here.